In January 2004 it was announced that Downe Hospital would be part of a 48m enhancement programme to modernize and improve patient services. Scott Wilson was appointed to design the new hospital and approached Architen Landrell early on in the scheme development to help design a number of canopies accross the hospital site. Also working alongside contractor McLaughlin and Harvey, the designs changed a number of times before a scheme was settled upon. 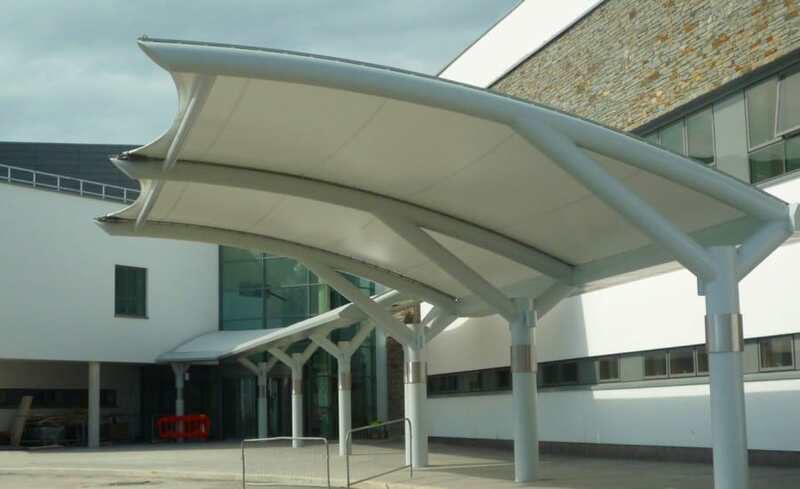 This carefully developed plan included two tensile fabric canopies at the front entrance of the hospital to keep patients and staff dry as they come and go. Following the successful design, Architen Landrell was tasked with the fabrication and erection of these two adjoining canopies. 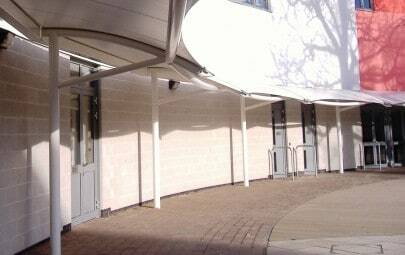 The first tensile canopy serves as an ambulance drop off point, leaning away from the adjacent hospital and over the service road to allow high vehicles to get as close to the pavement as possible. 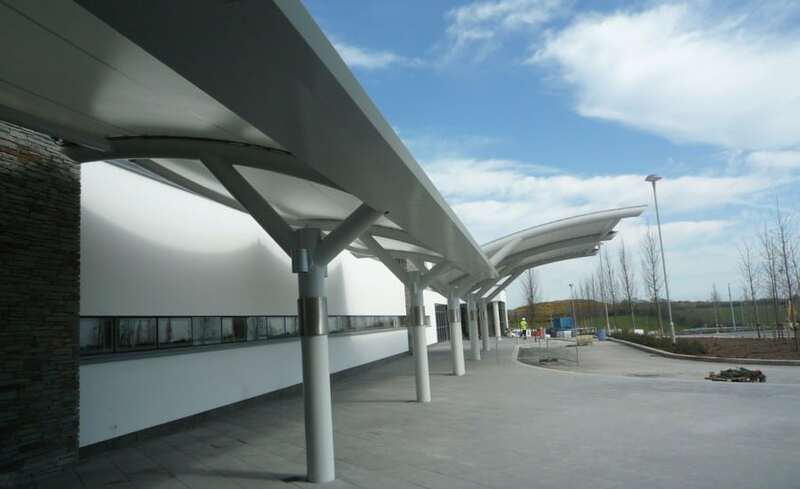 The second canopy leans in the opposite direction, towards the adjacent hospital, to provide shelter to pedestrians as they walk around the hospital site and to redirect water runoff away from commuters. 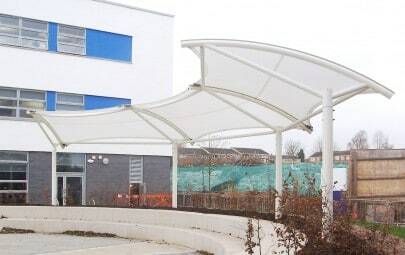 Both canopies were manufactured from PVC coated polyester in order to provide an economical solution without compromising any of the aesthetics. 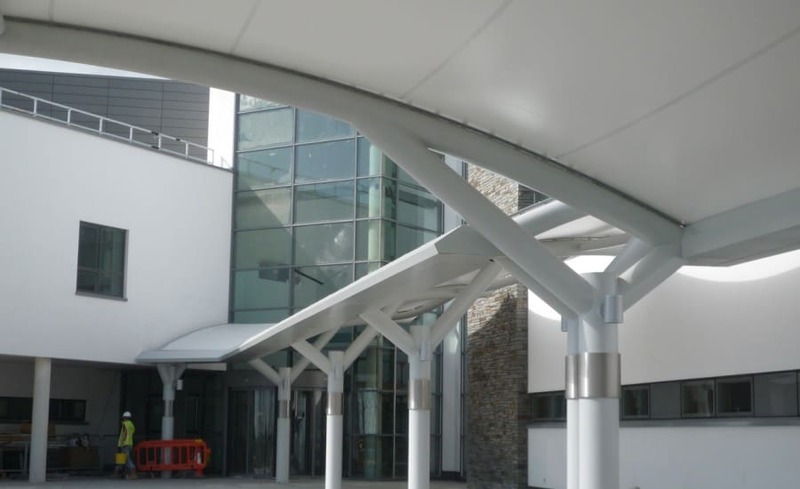 While the canopies have an obvious practical use, they are also a dramatic design statement which provides an identity to the hospital entrance. As part of the overall landscape design, the canopies were also designed with the specific needs of patients. Designers Scott Wilson aimed to create a relaxing and calming escape from the busy hospital, particularly for patients suffering from dementia and psychiatric disorders. 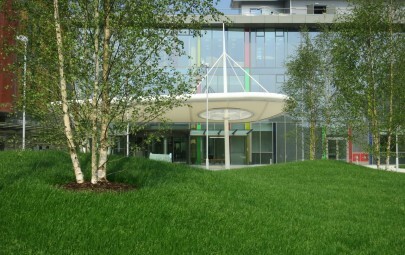 Mixed in with the old estate, the new canopies contrast nicely from the hospital building and brightly coloured planted surroundings and provide sheltered spaces for patients to take a breath of fresh air.